Hakuho est toujours second du classement. Aujourd’hui, le yokozuna s’est imposé face à l’ôzeki Terunofuji. Kisenosato se rapproche petit à petit de ce qui pourrait être le premier titre de sa carrière. De plus, l’absence du yokozuna Kakuryu constitue pour l’ôzeki une véritable aubaine. L’ôzeki Kisenosato est resté dans la course au yûshô bien qu’il ait été mis en danger par le maegashira 5 Endo à plusieurs reprises. 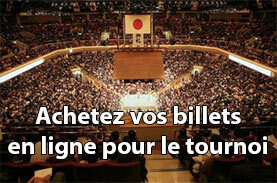 Endo a obtenu une prise de la main droite au mawashi de Kisenosato mais il n’a pas pu la tenir. L’ôzeki a repris le dessus en s’imposant par kotenage. Kisenosato, qui a déjà été plusieurs fois candidat à la promotion au rang de yokozuna, conserve toujours la tête du championnat. Il est suivi par Hakuho, Ichinojo, Sokokurai et Takanoiwa. Hakuho a clôturé la journée en profitant du manque de concentration de son compatriote Terunofuji pour le sortir du dohyô. 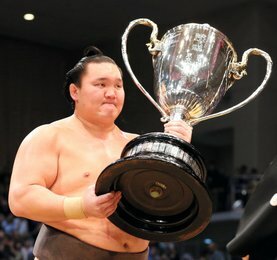 Le yokozuna Kakuryu, qui a remporté le précédent tournoi en novembre à Kyushu, s’est retiré du championnat. C’est le second yokozuna forfait après le retrait de Harumafuji. C’est l’ôzeki Kotoshogiku qui a bénéficié d’une victoire par défaut. Izutsu oyakata, le maître de Kakuryu, a déclaré que le yokozuna avait été blessé au coude gauche lors de son combat contre Shohozan et s’était également plaint de douleurs aux pieds et dans le cou. Le maegashira 13 Ichinojo est resté à distance de Osunaarashi avant de pouvoir le battre dans le combat d’ouverture de la journée en division makuuchi. Le make koshi de Osunaarashi l’obligera à redescendre en division jûryô au prochain basho. Sokokurai s’est également maintenu dans la course au titre grâce à sa victoire par yorikiri sur Takakeisho. Takanoiwa a lui aussi assuré sa place de second en battant Chiyoshoma. L’ôzeki Goeido est arrivé à obtenir une majorité de victoires en envoyant à terre le maegashira 3 Ikioi. Makuuchi : Goeido, Takayasu, Mitakeumi et Hokutofuji. 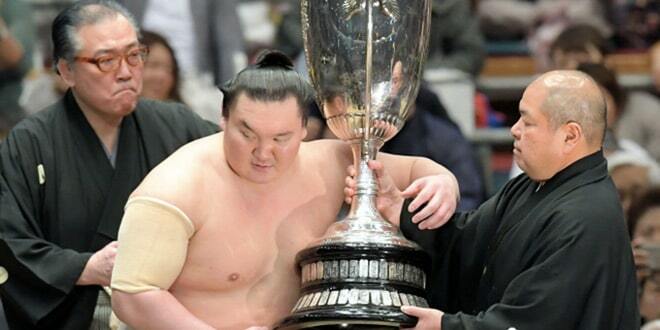 Perennial bridesmaid Kisenosato dug himself out of a hole to keep his one-win advantage, while Kakuryu became the second yokozuna to withdraw from the New Year Grand Sumo Tournament on Wednesday, the 11th day of the 15-day basho. Ozeki Kisenosato (10-1) stayed on course for an elusive first title, but only after very nearly coming a cropper in the day’s penultimate bout against fourth-ranked maegashira Endo (5-6). Endo got a right-handed grip on Kisenosato’s belt but could not hold on and the ozeki turned the tables to floor him with a kotenage armlock throw. Kisenosato, who despite repeatedly being a candidate for promotion to yokozuna has yet to win a grand sumo tournament, stayed one clear of Mongolian grand champion Hakuho and rank-and-filers Ichinojo, Sokokurai and Takanoiwa. Hakuho rounded off the day’s action by taking advantage of a lapse in concentration from compatriot Terunofuji (4-7) and forcing the ozeki out for the win. The 31-year-old Kakuryu, who won the Kyushu title in November, has struggled at this tournament and lost his fifth bout on Tuesday. Kakuryu’s (5-6) exit comes after countryman and fellow grand champion Harumafuji withdrew from the 15-day meet with a hamstring injury on Saturday. 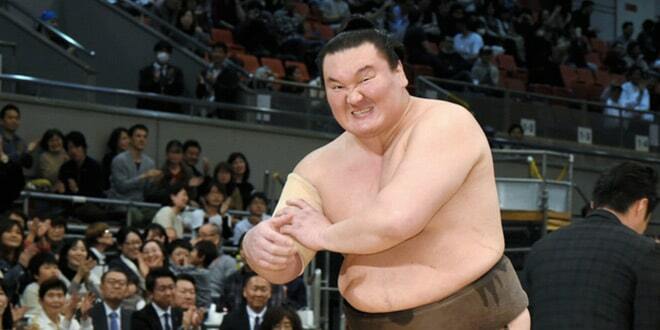 Kakuryu forfeited Wedneday’s scheduled bout against ozeki Kotoshogiku (4-7). 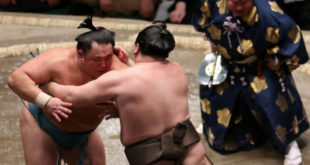 Kakuryu’s stablemaster Izutsu said the yokozuna had hurt his left elbow in his second-day match against Shohozan and also complained of foot and neck issues. Back on the raised ring, giant Mongolian No. 13 maegashira Ichinojo stayed within striking distance of the lead after marching out Egyptian No. 16 Osunaarashi in the day’s opening bout in the top makuuchi division. Osunaarashi looks set for an immediate return to the second-tier juryo division after being saddled with a majority of losses. Chinese-born No. 10 maegashira Sokokurai also kept himself in the thick of the title race with a hard-fought yorikiri win over 12th-ranked Takakeisho (4-7), before Takanoiwa dodged a bullet to shove out sixth-ranked Chiyoshoma (5-6). Ozeki Goeido (8-3) secured a winning record after squeaking out a victory with an overarm throw against third-ranked maegashira Ikioi (7-4).